TAMAS® Lite is a software for acquisition and loading data. The main functions of the system are importing or manual entry of loading schedules, automatic import of transactions data from batch controllers, data visualisation, reporting, preparation, printing of documents, alarm handling, and database management.TAMAS®Lite is an economical solutions for applications where automated loading control is not required. TAMAS® Lite allows quick implementation which requires just installation onto a workstation, setting of communication parameters and linking to import loading schedules. On request, customisation of printed documents can be programmed. The system is a perfect solution when delivered together with pre-fabricated measuring skids. Eastern Energy services is able to deliver completely "set systems" with minimum requirements for on-site configuration which reduce cost and delivery schedules. 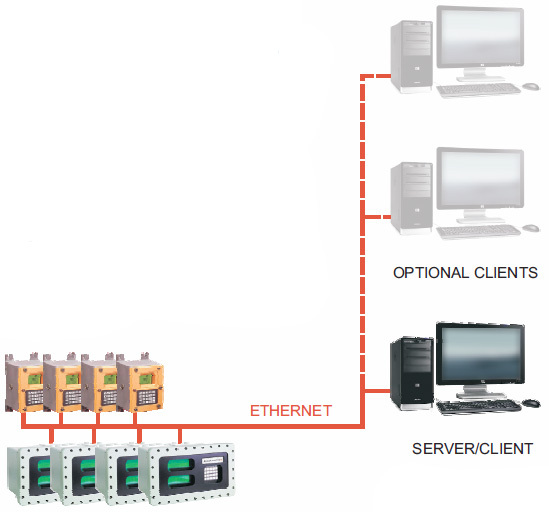 TAMAS®Lite can be interfaced with Microload.net and Accuload III batch controllers via Ethernet. The system adopts Web Server/Client architecture which allows installation on one or more workstations. Hardware/software requirements: workstation - personal computer certified for professional usage with Windows XP or higher operating systems, and Microsoft Internet Explorer 8 or newer. TAMAS® Lite monitors operation of presets but does not protect them against unauthorised access - operators may load products without any restrictions. TAMAS® Lite is not suitable for blending control and monitoring. A client makes an order for fuel. The order can be inserted into the TAMAS® Lite manually through a web form or, optionally imported from company information system. In this case it is necessary to implement an interface for loading schedules/ data exchange between the enterprise information system and TAMAS®Lite. After an order is in place, specific loading schedules (plans) can be inserted the same way. 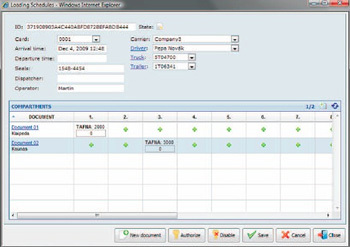 A loading schedule is a data record containing all information necessary to dispatch one tanker: Driver's data (ID, virtual ID number, name), transport details (carrier, truck and trailer registration numbers or rail tanker numbers, seal numbers), product and quantity in every compartment, which compartment belongs to which customer and delivery place. Since a loading schedule is available, a driver may come in dispatching room for check-in. Using information stored inTAMAS® Lite, the dispatching personnel verifies the drivers´ identity, his authorisation to access the loading facility, approvals, training validity etc. 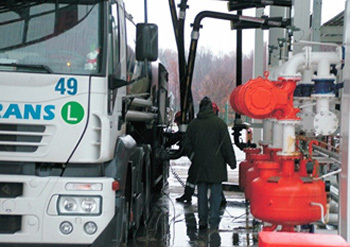 The main task is an activation of the specific loading schedule and to provide the driver with the information necessary for loading - type and quantity of fuel to be loaded into each specific compartment and unique personal identification number (PIN). After a loading schedule is activated, the driver is allowed to drive in his truck in a loading bay. There the driver or operator has to prepare for the loading: The operator must connect the grounding monitor/overfill monitor as well as connect loading and vapour arm(s), whichever is applicable. The driver must enter the PIN into the preset, set the loading data and start the loading. If technically possible, more compartments can be loaded at the same time. After the required quantity is loaded into a compartment, loading is automatically stopped and the driver confirms the loaded volume by pressing key on electronic preset device keyboard. At this moment, the transaction data are printed automatically on the BOL printer and imported into theTAMAS®Lite database. Thanks to virtual identity and driver´ side identification by PIN,TAMAS® Lite automatically recognises which transactions belong to which specific driver. After the loading of all compartments is completed, the driver disconnects the arm(s) and monitor(s), leaves the loading bay and goes into the dispatching room for check-out. The transaction data is saved and delivery notes belonging to the driver are automatically printed by TAMAS® Lite. The delivery notes are automatically split into more documents according to customers and delivery places in the loading schedule. The following information is typically included in delivery notes: customer name, supplier name, product, quantity, quantity at reference conditions, date and time, driver, tank truck, safety instructions, etc. The scope of the data can be customised but commercial data like prices, taxes etc. cannot be included. After saving the transaction data, delivery notes can be replicated to the enterprise information system via ODBC data source (data structure available on demand from the supplier). If the information system is not accessible, the data is buffered and replication is executed as soon as the connection is established again.